Elaine Cogan grew up in Brooklyn, New York and moved to Portland as a teenager with her parents. She graduated from Lincoln high school where she was a classmate of former mayor Bud Clark and local celebrity Darcelle XV. Elaine met Arnold Cogan when they were juniors in high school and they married in 1952, when they were juniors at Oregon State University. Elaine and Arnold are partners in Cogan Owens Cogan LLC, a planning and communications consulting company founded in 1975. Besides writing three books, Elaine and her firm have received several national awards for their work bringing people together to solve difficult political and civic challenges. 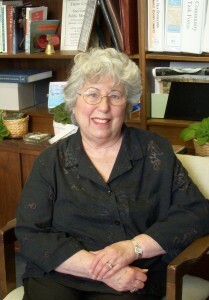 Elaine was named a “Woman of Achievement” by the League of Women Voters of Oregon and is a past president of the Portland League. She has also been a host of a weekly radio show, a columnist for the Oregon Journal and The Oregonian, as well as a television political commentator. When Bob Straub was governor, Elaine chaired the Commission on Liquor Control. Before Elaine, restaurants could only serve wine. Thanks to her work and recommendations, a law was passed allowing restaurants to serve mixed drinks. She was also the first woman chair of the Portland Development Commission and the first woman president of Congregation Neveh Shalom. Gardening, cooking and baking are Elaine’s weekend hobbies and she has made all the family’s bread for many years. Among her repertoire are challah, rye, pumpernickel, whole and cracked wheat and sour dough. For the latter, she uses a sour dough starter she has nurtured since 1985. Elaine credits her eclectic interests in food and cooking to her late mother-in-law, Anne Cogan, who reared a family of six children in Bath, Maine. While Anne barely knew how to boil water when she was married at age 18, she became an outstanding cook, and made Elaine one, too!